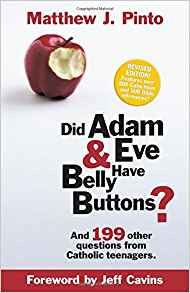 With more than 130,000 copies sold, Did Adam & Eve Have Belly Buttons? is the number one book for Catholic teens. It offers today s young Catholic 200 clear and insightful answers to questions about the Catholic Faith. This book captures the attention of teens by directly addressing their concerns, misconceptions, and challenges. The revised edition adds over 500 Bible and 800 Catechism of the Catholic Church references, and has been granted an imprimatur.